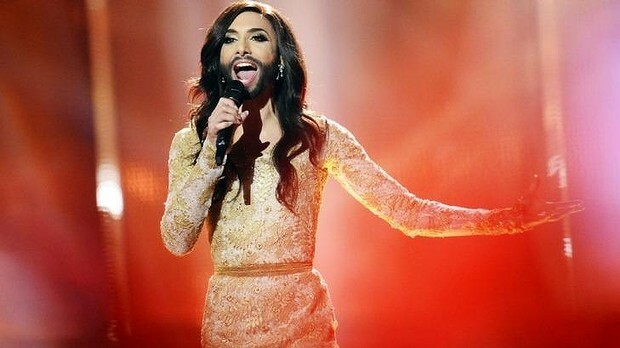 ‘Like a Phoenix, I will rise from the ashes’, sang Conchita Wurst, the bearded drag queen who stunned Eurovision 2014. It used to be there were ‘accepted’ or orthodox sources of ‘correct’ information. First our parents and teachers, then the church, the government, our employers, doctors, the police. My trust betrayed many times over by politicians and priests, I realise God indeed works in mysterious ways and speaks through unlikely instruments: Noah, Mary Magdalene, the thief on the cross, the leper, shepherds, fishermen . . . drag queens. So I like to keep an ear out for men and women who are channelling wisdom, however unlikely they seem as instruments of ‘divine inspiration’. I’ll take my inspiration (or breath) from anyone and every one—human, plant, planet or animal. Conchita Wurst caught my eye for her audacity and style and for a great anthemic song. For a long time we hide our breathlessness with a bag of tricks. When walking with friends I would stop and intently inspect a flower or some doodad, while really catching my breath, ‘Oh, look everybody, a 28 spotted ladybird’! I would start off ahead of people. I would illegally park as near as possible to a venue and get fines. I would arrive way early and get a seat and sit tight. Once a taxi driver asked me for $20 just to carry my bags a few metres from his cab into the airport. Now I am a woman remade in the image and likeness of lung disease, if you like. It has altered my life, my appearance and narrowed my choices, along with my airways. As the wise and kind blogger Sheri de Grom (http://sheridegrom.wordpress.com/) says about chronic disease, ‘you can live or you can die’. You can also transform yourself. And rise like a Phoenix from the ashes. Who of us is not changed by our disease? We know the deficits; the red ink that includes breathlessness, fatigue, wheezing, wasting, isolation, fear, panic, depression, pain, incapacity and premature death. So every day I need to balance the books and to count the ways in which having a progressive, terminal lung disease has brought blessings into my life. Everything in my world has meaning. My journal from May 2002 records my lung capacity as 29%. I am then aged 45 and have moved from Sydney to the coast on the advice of a lung specialist. I am angry, sad, scared, bewildered and continuously breathless. I will never use my tennis racquet, 10-speed bike or my surfboard again. Today, 12 years on, my lung capacity is 12%. I have a kayak. I sleep like a baby, eat like a king, have an optimistic outlook and actively purge anger from my life. (See post ‘An Open Letter to Big Tobacco’). Not only is life too short to sweat the small stuff, resentment makes me breathless. I practice gratitude, I exercise, and I sing along to music, every day. (See post ‘Songs on Script’). I remember vividly the day it all fell down. I was 38 and my partner Frances Rand and I, who owned a thriving small business, were booked to holiday on the island of Lombok in Indonesia. Instead of palm trees, grass huts and Mai-Tais, I had what I now know was a severe exacerbation and I spent Christmas and New Year alone in the lung ward of St Vincent’s Hospital in Sydney. It was the beginning of my ‘new normal’, being out of step with what was average for a person my age. I had left the world of wellness and entered the world of illness. They are as different as orient and occident. Now, I am a spectacle, a bit like the bearded drag queen. I’ve had to come out. I cannot hide in the farmer’s market with my nose hose and my portable oxygen. I have lost the anonymity of being an ordinary shopper, but I have broken the silence around an invisible disease. A disease that untold millions of us suffer from worldwide; a disease that’s a giant killer…yet is barely seen in public. People certainly feel shame for having Copd. You rarely find people with heart disease or diabetes eaten up with guilt over their diets. People getting sports injuries repaired on the public dime have no shame. But ex-smokers feel they deserve everything they get. And we are second-class citizens when it comes to research dollars despite having contributed mightily through taxes on cigarettes. It would be a lie to tell you I relish coming out with Copd. I do not, and I hid it for the longest time. The Copd closet is full of sad, guilty, sick people putting off getting help. I’d much rather advocate for rich, middle-aged mountaineers, or global roaming organic foodies, or mad old chicks on motorbikes, but here it is! I am what I am, I tell myself, as I leave the house with my lungs in a backpack. To leave a comment, click on the title & scroll down. This entry was posted in Uncategorized and tagged anger, Big Tobacco, blog, breathlessness, Conchita Wurst, COPD, copd closet, Emphysema, Eurovision, FEV, forgiveness, Gratitude, lung capacity, Oxygen, Rise Like a Phoenix, singing, smoking, St Vincents, trust. Bookmark the permalink. Anyway I used to drink heavily and smoke like a chimney when drinking. That finished many years ago and so far I’m not paying for my choices. But I may do so down the track. Let us all remember the dumb stuff we’ve done and the stuff that while we might not be paying for it doesn’t in any way mean we’re better than those who either still do the dumb stuff or those who are suffering because of their earlier choices. Bless you Barb … I love your honesty. It’s refreshing. Thanks Jo. Like some of us get caught speeding, others don’t! Bill, you gorgeous man. Re me being special. I like to say, ‘if you spot, you got it’! That she is Bill…I know her well …enough…for the past 51 years shes been such an inspiration and how blessed I am to be able to call her my sister..
Hey Cath, you and Aaron, Jake & Jules have always been the best family a girl could wish for. I love you to the moon and back. Thank you for your never-ending optimism. You are indeed an angel. Van, yes! I took the kayak out today. The hardest bit is getting it on and off the car; you need a friend for that. Or hire one already in the water. It’s easy to paddle with the right technique and worth getting some instruction. Keep on flat, safe water at first. A nice stream, river or lake. No wind. White water only in your dreams. Kayaking is my favourite thing to do. I would love to see you have a go. In fact Van, I dare you . . .
You guys have a short summer Van, so get going . . . And maybe buy a cheap, disposable water proof camera till you get the hang of staying in the boat! Thanks for adding your voice to the COPD world I reluctantly find myself a part of! You’re right – there is shame I had not acknowledged. I would tell people I have COPD & then automatically say “I wasn’t smart enough to quit smoking.” I never even thought of the qualifier I have always added to my disease! Yes benzknees. The shame. It hit home to me hard one day when a few of us at coffee were told John P. had died. Sunlight removes the stain of shame. We need to raise our voices because in whose interest is it that we remain silent? Thank you for visiting and for your lovely blog, which I commend to any passing reader. Barbara – Another stunning post. I’d never thought of COPD being a disease associated with shame or stigma of any kind. I however can see that it is as your followers have added their thoughts. When my friend Tess led me to Huntie and Kanzen I met Bill. Thus, begins my education into the world of COPD. Now I understand why mega pharmacy is always advertising their products. Perhaps the reason I never saw COPD as a shameful disease (and I still don’t) is that my mother died of congestive heart failure and her lungs were often full of water and she couldn’t breathe. She never smoked a day in her life. I’m diabetic and sure I could feel guilty and would be guilty if I ate everything I thought I wanted to eat, but I don’t. I can be just as crazy the opposite way and have been. Before I met Tom I was running 10 miles every day, riding my bicycle 20 miles a day, working 10 hr days and going to graduate school 3 nights a week. Additionally, I never let more than 1,200 calories cross my lips. So, I guess you could call me guilty as anyone else. I’ve done terrible things to my own body simply because I thought I was worthless and didn’t deserve any better, until I met Tom.